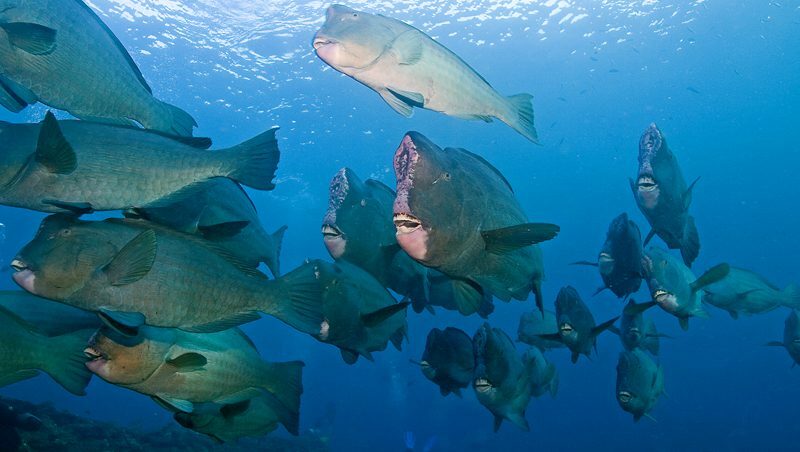 Sci-fi movies often speculate about aliens, Martians and all things from outer space but when taking a look at the bumphead parrotfish it seems as though Hollywood film makers may have been inspired by life from under the ocean rather than outer space. When you imagine an alien life form what features come to mind? Protruding jaws? Scales? Bulbous foreheads? Insane dentistry? Creatures most commonly seen at night? 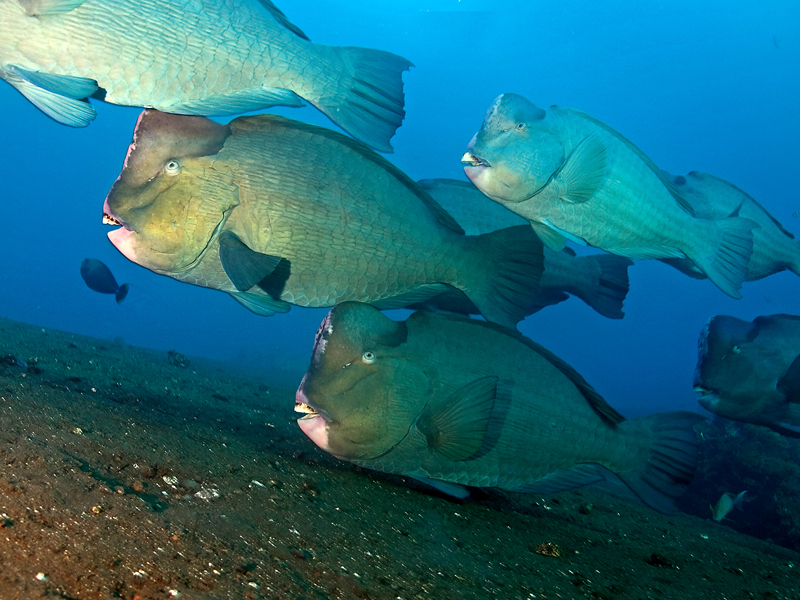 If those are the criteria then the bumphead parrotfish definitely ticks all of the boxes! 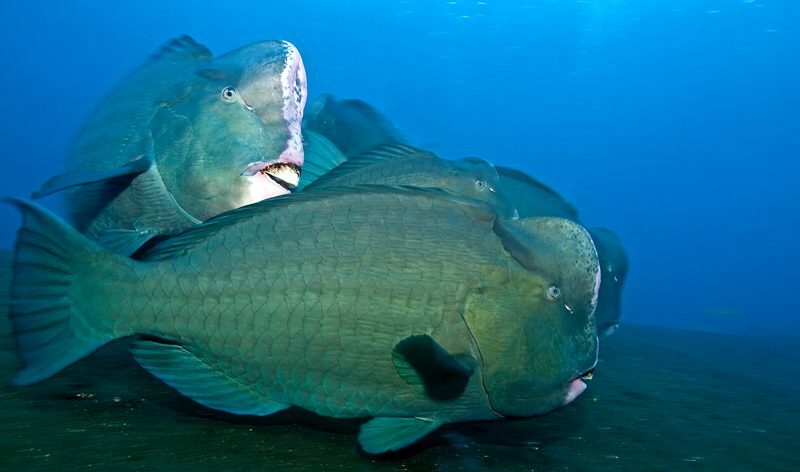 The bumphead parrotfish (Bolbometopon muricatum) which is also known as the humphead parrotfish or green humphead parrotfish grows up to a monstrous length of 1.3 meters and can weigh up to 46 kilos (100llbs) which makes it both the largest and heaviest of all parrotfish species. Their growth process is slow and they can live up to 40 years. Bumpheads don’t reach sexual maturity until late in life so their replenishment rates are low but despite this they are not listed as endangered. As bumpheads age they develop their alien like bulbous foreheads, from which their name is taken. 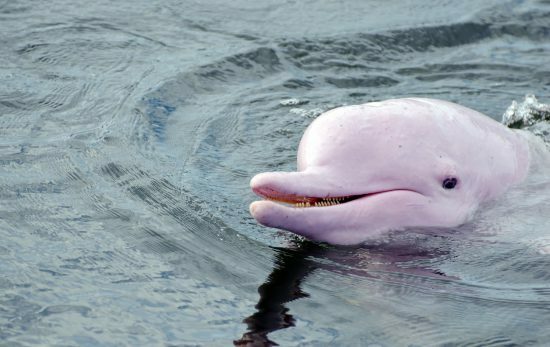 To add to their catalogue of features they have huge beak-like front teeth which are almost fully exposed as they are only partly covered by their lips. Bumpheads generally live in small aggregations but group numbers as large as 75 have been recorded. Juveniles are often found in shallow lagoons and sea grass beds whereas adults tend to be in outer lagoons or on sea reefs above 30 metres. They’re often found sleeping in caves (like many Hollywood monsters) or on shipwrecks during the night – making night dives a great time to spot them. 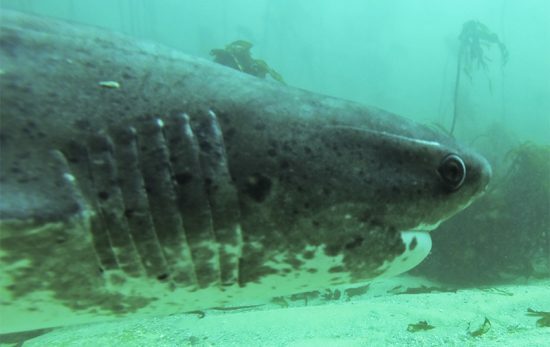 Dawn dives can also be another good time for catching a glimpse of this strange looking species as they make their way from their shallow sleeping areas to the deeper waters. Bumpheads survive on a diet of benthic algae and live coral and ironically they contribute substantially to both reef degradation and maintenance. When feeding bumpheads will ram their heads against hard corals to break them down into smaller, more easily digestible pieces and in one year a mature bumphead will consume over 5 tons of structural reef carbonates. Bumpheads do give back though and much of what they consume is passed out in their faeces making them an important part of the reef eco-system. Due to the bumpheads extraordinary protruding dental arrangement their teeth marks are very easily identifiable on coral reefs. Few other species have teeth big enough or outward enough to bite in the same way. Despite their large size, unfortunate appearance and their somewhat ferocious looking fangs bumpheads are a very docile species – especially at night. If divers see bumpheads sleeping it’s important to stay still and passive and to avoid shining torch light directly at them if you want them to remain undisturbed. During the day the species is usually spotted on the move or “grazing” and is still easily approachable. Bumpheads are just one of many unusual and unique looking species in our oceans. If you are interested in finding out more about the weird and wonderful creatures under the sea then use the PADI Dive Shop Locator to find a dive centre in your area and ask about taking the PADI AWARE Fish Identification Specialty Course. 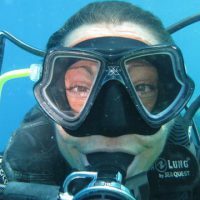 It’s fascinating to learn more about the marine species of a specific area as well as common families and groups. You might be in for a surprise!